March 30, 2015: It's déjà vu all over again. For the third time in less than a year, sky watchers in the United States can see a total eclipse of the Moon. The action begins at 3:16 AM Pacific Daylight Time on the morning of April 4th when the edge of the Moon first enters the amber core of Earth’s shadow. For the next hour and 45 minutes, Earth's shadow will move across the lunar disk, ultimately swallowing the entire Moon at 4:58 AM PDT. East of the Mississippi River, the eclipse will be interrupted by sunrise. People can see only a partial eclipse. West of the Mississippi River, people can see the whole thing, including totality. "Totality" is when the Moon is fully inside Earth's shadow. Some total eclipses last for more than an hour. In this case, however, totality spans just 4 minutes and 43 seconds—a result of the fact that the Moon is skimming the outskirts of Earth's shadow rather than passing centrally through it. The brevity of the eclipse highlights the importance of watching the clock: Be outside no later than 4:58 AM PDT to witness the red Moon! A quick trip to the Moon provides the answer: Imagine yourself standing on a dusty lunar plain looking up at the sky. Overhead hangs Earth, nightside down, completely hiding the sun behind it. The eclipse is underway. You might expect Earth seen in this way to be utterly dark, but it's not. The rim of the planet looks to be on fire! As you scan your eye around Earth's circumference, you're seeing every sunrise and every sunset in the world, all of them, all at once. This incredible light beams into the heart of Earth's shadow, filling it with a coppery glow and transforming the Moon into a great red orb when viewed from Earth. 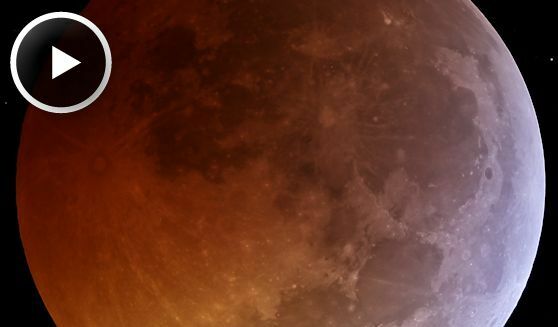 The total eclipse of April 4, 2015, is the third of four total lunar eclipses separated by approximately 6 months, a phenomenon astronomers call a "tetrad." Such a closely-spaced succession of eclipses is a fairly rare occurrence. The complete list of dates is April 15th, 2014; Oct. 8th, 2014; April 4th, 2015; and Sept. 28th, 2015. Set your alarm before sunrise on April 4th, and enjoy the show.